Listen to "He Was Really Sayin' Somethin', their late 1964 hit. Listen to their early 1964 hit, "Needle in a Haystack". 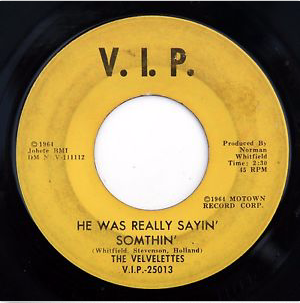 Listen to the 1963 recording of "There He Goes"
​A girls group of early Motown fame, the Velvelettes were performing at a fraternity function when they were discovered by Robert “Bob” Bullock. Bullock was the nephew of Berry Gordy and son of Gordy’s sister, Ester Gordy Edwards, of Motown and Hitsville USA fame. They were known as "The College Girls", or "The Choir" by their friends at Motown, standing apart from the other groups--smart, sophisticated, middle-classed ladies. The original group was founded by Bertha Barbee (McNeal) of Flint and Mildred Gill (Arbor) of Kalamazoo. The two young women were college students at Western Michigan University. Barbee asked her cousin, Norma Barbee (Fairhurst), who was at the time a 17-year-old student at Southwestern High School in Flint, to join the group. Gill also asked her younger sister, Carolyn Gill (Arbor). The last spot was filled by Carolyn Gill’s friend, Betty Kelly. Their first recording, “There He Goes”, was originally written by Norma Barbee Fairhurst, though writing credits went elsewhere. Their big break came with the song “Needle in a Haystack” in 1964, reaching #45 on Billboard’s Hot 100. Norman Whitfield, the producer on “Needle in a Haystack”, also worked with them on another hit, “He Was Really Sayin’ Somethin’”. That song hit #21 on the R&B chart, as well as the Top 100 in the pop chart. Little Stevie Wonder was featured playing harmonica on both “There He Goes, and “That’s the Reason Why”. They toured under the Motown label, opening for the Temptations. Years after their debut, Berry Gordy acknowledged the importance of The Velvelette’s song, “Needle in a Haystack” because it allowed him to keep Motown afloat early on, before any contributions had even been made by the Supremes or other Motown artists. Except Stevie Wonder, they are the only Motown group to have ever recorded songs in French, and enjoyed a huge following in England. The Velvelettes music influenced countless artists. In an article by Rolling Stone published October 27, 2016, written by Maura Johnston, about Amy Winehouse, Winehouse cited the Velvelettes … and the Shangri-Las as two of the groups who influenced her writing. ​“He Was Really Sayin’ Somethin’ became a hit again, when it was covered by the English 80’s girl group, Bananarama. You can also find The Velvettes featured on the Motown Museum site, www.MotownMuseum.org. 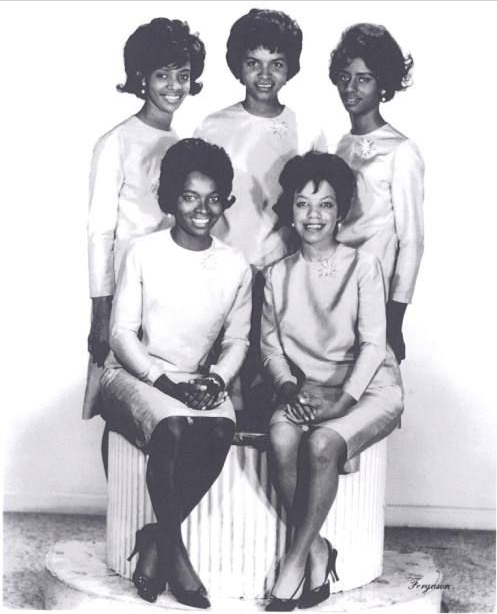 Click here to listen to a fascinating and fun interview from Fish and the Flint Chronicles with Norma Barbee Fairhurst about The Velvelettes in the early days with Motown. According to Norma Barbee Fairhurst, this photo was only the second photo ever taken of the young Velvelettes as a group. Berry Gordie's sister, Ester Gordy Edwards, had taken them to Detroit's famous Hudson's Department Store on Woodward Avenue to clothes shop. After purchasing their new outfits, she took them to Hudson's photography studio for this picture.